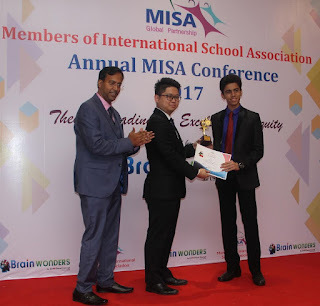 Mumbai, February 13, 2017: Achiever student Jash Ramani along with his teacher Ms. Monika Koradia, were felicitated at the Annual Conference organised by MISA (Members of International Schools Association) at Hotel Sea Princess, Mumbai on February 11, 2017. The event was organised in an effort to acknowledge the efforts of learners and teachers who have made their school and country proud as subject toppers in the March 2016 Cambridge International examinations. This is the first time that MISA has taken the initiative to felicitate the country achievers. Jash Ramani was honoured for being the country topper in Accounting subject in his IGCSE examinations 2016. He secured 98% in the subject to be able to top in the examinations. His teacher, Ms. Monika Koradia too was appreciated for mentoring and guiding Jash on the subject, contributing to his excellent performance in the examinations. Both, the student and the teacher were felicitated by Mr. Henry LEE Yan Fong, WellGene International Business Partner and Mr. Manish Naidu, Founder, Brainwonders at the event. MISA was formed with an objective to help all Cambridge International Schools in India. The organisation focuses on a lot of training programmes and cross-sharing between teachers of Cambridge International schools, as well as offers a platform for students to exhibit their talent and aptitude. MISA Annual Conference is an enriching platform for sharing new ideas in educational fairness and excellence. The event witnessed the presence of more than 70 delegates from various schools as well as over 100 school leaders, attending the conference. Smt. Parmeshwari Devi Gordhandas Garodia founded the P.G. Garodia School in 1969 with the sole mission of ‘Education for all’. Her noble initiative was brought to fruition with the establishment of the P.G. Garodia School (ICSE board). The school has been at the forefront of innovation in education, adopting modern methods of teaching, making the environment conducive to learning for all its students. The year 2000 saw Mr. Nishant Garodia taking over the reins and actively fostering education from kindergarten to tertiary segments, across India. Garodia Education has set up numerous verticals aimed at the overall and optimum development of students – Garodia’s Academy, Garodia International Centre for Learning, Beehive, a chain of franchisee-based pre-school, P.G. Garodia Conservatoire – A Music School, One World International Sports Centre and a Department of Early Childhood Care and Education. Garodia Education is recognized for its consistent efforts towards the development of students into not only accomplished intellectuals but also celebrated leaders. Over the years, Garodia Education has been endowed with many awards notably amongst which are the British Council’s International School Award in 2009 and the Dell Digital Award in 2010.